Today’s post comes from Rachel Chen, Jessica Na and Darren Yang, three students at Peking University High School’s International Division, which recently hosted a visit by the head of the OECD’s PISA programme, Andreas Schleicher. Following Shanghai’s success in PISA last year, the student-assessment programme became much better known in China, and many journalists now want to know more about it. 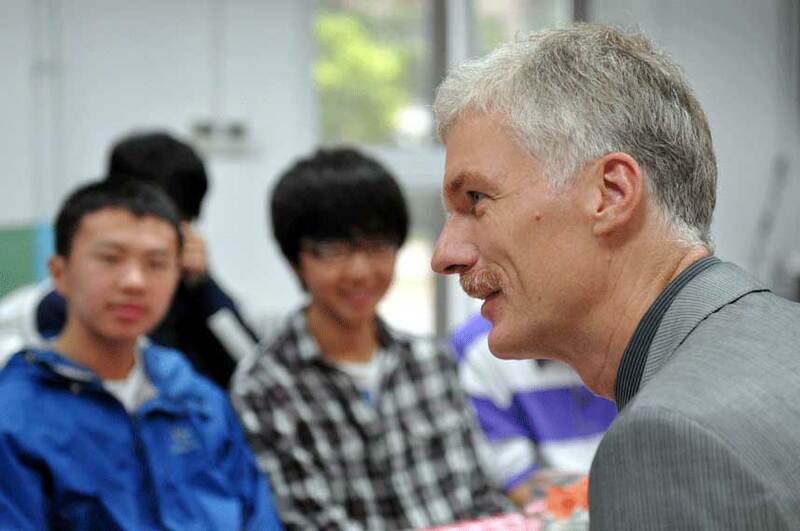 To answer some of their questions, Andreas Schleicher, the head of PISA, recently visited the International Division of Peking University High School and held a press conference. First, however, Mr. Schleicher arrived at the kitchen of our International Division and had breakfast with some of us students. We were all excited about his visit and got up early to wait for him. Mr. Schleicher was a tall and amiable man. He was curious about our experiences as students here, so he asked us a lot of questions such as “How did you choose your courses?” and “What do you do in your free time?”. We were so absorbed in the conversation that we barely ate. After breakfast, Mr. Schleicher attended the conference, where he showed he had a lot of thoughts on education. We were really impressed by two points he made. The first was that as the world develops, getting knowledge becomes easier. So, the ability we should foster is not only how to collect knowledge, but how to select knowledge that is true and useful to us and apply it to solve problems. For instance, nowadays, most students know how to use computers and collect knowledge on the Internet; they can use it to get the answer to a math question if they want. However, students may find different answers on the Internet, and they need to think about which one is the right one. Most students can do that, but not so many can really use the math knowledge they’ve got to solve real-life problems. The second point is that learning should be life-long. In other words, school is just the beginning of learning. Nowadays, a lot of people stop learning once they leave school, which is a sad thing to say. Educators can change this by motivating students instead of forcing them to learn, because only students who are motivated can keep learning in their lives. For example, if a teacher shows students how enjoyable reading is, some students will become interested in reading and will read more by themselves. Eventually it will become a life-long habit. Mr. Schleicher thought China’s education didn’t do well on motivating its students, but he did think that the serious attitude of China’s government toward education is laudable. Though there are still some problems with China’ education system, he is glad to see the effort that China’s government had put in to solving the problems. Mr. Schleicher’s visit made us think more on education. We feel lucky to study in a school where the teachers motivate and encourage us, and where the resources for learning are abundant. We hope we will be able to go on learning all the way through our lives and be successful. Chinese and others should also learn the importance of sharing knowledge. In recent years there was much concern with regard to the spread of “Bird ‘Flu” avian influenza and the potential risk of it becoming a pandemic affecting human communities. At that time Chinese authorities were reluctant to release data concerning human cases this had a negative effect on global epidemiology of major concern to public health authorities. Sounds like a wonderful programme. How I would have loved to have students such as these more often.